Costa Coffee has been voted the ‘Nation’s Favourite Coffee Shop’ by Allegra’s independent panel of consumers1. Demonstrating the affinity for the Costa Coffee brand on UK high streets up and down the country, Costa Coffee has claimed the top coffee shop spot for the ninth year running. With the UK coffee shop market entering its 20th consecutive year of growth in 2018, the branded coffee shop segment has continued to outperform in a challenging economic environment. Growing demand for experience-led hospitality has enabled coffee shops to offset recent challenges on the UK high street. As consumers expand their tastes and refine their coffee knowledge, coffee shops have successfully catered to this growing interest, with Costa Coffee playing a key role in educating customers on a widening array of products and in-store experiences. The ‘Nation’s Favourite Coffee Shop’ accolade signifies Costa Coffee’s enduring appeal as a pillar of the UK’s vibrant café community and its status as an integral part of the nation’s daily routine. Costa Coffee has also been named by consumers as the UK’s most ethical coffee shop2. 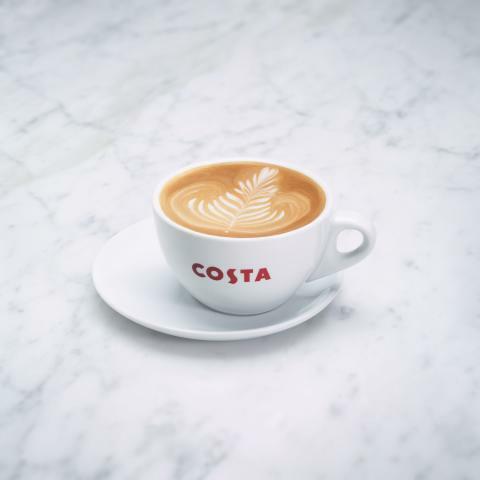 Whether powering its roastery with 100% renewable energy, diverting over 7,000 tonnes of waste from landfill or removing 45 million plastic straws from its 2,600-plus stores, Costa Coffee’s sustainability credentials are impressive. Last year Costa Coffee launched an industry-leading recycling initiative that pays waste management companies to recover and recycle takeaway cups. Over 65 million cups have been recycled since its launch, with other leading coffee and retail brands joining the scheme. The UK’s favourite also uses 100% Rainforest Alliance Certified coffee and supports the Costa Foundation to relieve poverty in coffee-growing communities, meaning customers can be sure their coffee is both kind to the environment and supporting farming communities. The Costa Foundation, a registered charity, was created to improve the lives of children in coffee growing communities by providing access to quality education. To date, the Costa Foundation has funded over 80 school projects and changed the lives of more than 75,000 children. The brand operates a UK-wide Community Programme, which enables and empowers their teams to volunteer their time to support good causes locally and to invite community groups to make use of Costa Coffee shops. 1 The question ‘what is your favourite coffee shop?’ was asked of an independent panel of 3,121 consumers, with 51.4% citing Costa Coffee as their preferred café. Allegra World Coffee Portal (WCP) is the global information platform delivering unparalleled insight on the global coffee, café and related food-to-go sectors. World Coffee Portal provides data, reports, research and consultancy to help businesses make informed decisions and is the only specialist information platform for senior decision makers in the coffee industry. Costa Coffee was founded in London by Italian brothers Sergio and Bruno Costa in 1971. *With over 2,380 coffee shops in the UK and more than 1,300 in 31 international markets we are the fastest growing coffee shop business in the UK and are proud to be the UK’s favourite coffee shop, having been awarded “Best Branded Coffee Shop Chain in the UK and Ireland" by Allegra Strategies for eight years running (2010, 2011, 2012, 2013, 2014, 2015, 2016 & 2017). Looking after coffee growers is extremely important to us, which is why we established The Costa Foundation, a registered charity with the aim to relieve poverty, advance education and the health and environment of coffee-growing communities around the world. So far, The Costa Foundation has funded the building of 72 schools and improved the social and economic welfare of coffee-growing communities.